I wanted something different for Halloween, so I decided to bring my childhood years into play. I used to love Curious George, so why not be The Man in the Yellow Hat? I wanted to make sure the top and bottoms matched, so I dyed a white shirt and white leggings, yellow. Since the leggings were slightly see through, I made sure to get an over sized t-shirt to wear. The hat took the longest to make. I wanted it to look just like the one he wore, but I couldn’t get the shape right. I’m still not fully satisfied with it, but my time was limited. I took a foam cowboy hat (from Michaels Craft) and cut out the top and added in foam sheets. I hot glued everything and added yellow felt over it. The tie is also made from the yellow foam sheet with black felt dots. I attached this to the shirt with a little safety pin. It was nice that I already had a brown crossover bag, belt, monkey and boots. 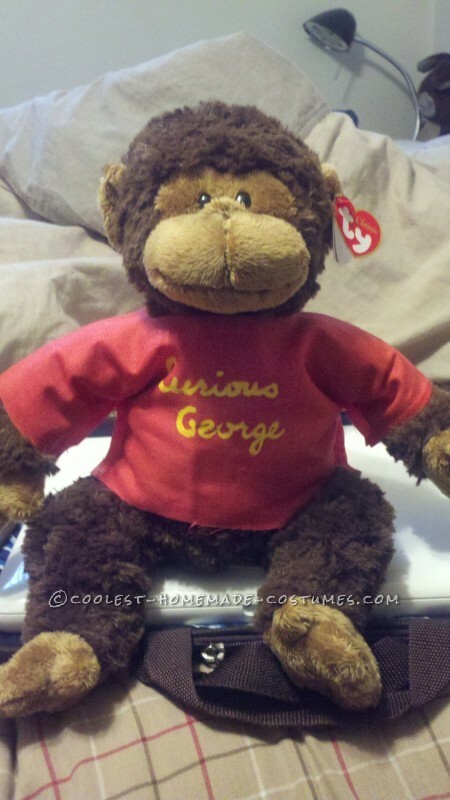 I wanted to make sure that everyone knew I was from Curious George, so I wanted to make a shirt for my monkey. The shirt was made from a red bandanna where I sewed into a little shirt and painted Curious George on it. I also had a Bananagrams travel game around and took out the game pieces to use the big banana as another decoration. The few people who recognized my costume, loved it. I had so many people think I was just a yellow crayon or a big banana with a little monkey, but that’s OK, I still loved it and it was easy to make!